Cyclepedia Press LLC authors powersports service manuals, a specification database and training modules to help technicians efficiently service ATVs, motorcycles, scooters and side by sides. Each month Cyclepedia examines real life shop scenarios with recommended tech tips for handling the problems encountered. For more information about Cyclepedia manuals and professional products visit www.cyclepedia.com. 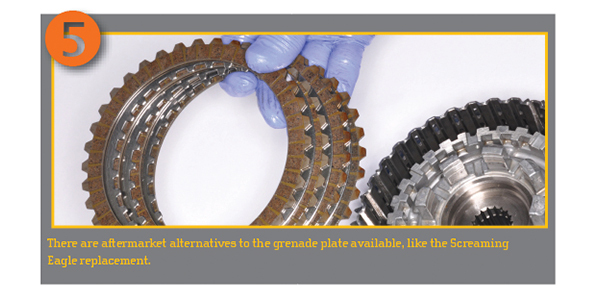 A grenade plate sounds like a piece of military equipment used to upgrade the armor of a vehicle or fit a grenade launcher to a rifle. Unfortunately this has become the nickname for a component found in the clutch pack of some of the most popular motorcycles on the road. The spring plate in the clutch pack of Harley-Davidson Sportsters and other EVO engine powered bikes has picked up this nickname by regularly flying apart and dumping shrapnel into the clutch. 1. This spring plate sits in the middle of the clutch pack. It is there to make for a smoother, more forgiving clutch. Other OEMs may use a judder spring assembly and/or damper springs in the clutch basket to achieve a similar result. 2. The spring plate is made up of two steel plates that sandwich flat springs. The assembly is riveted together. The rivets can loosen and distort the spring plate. Eventually the rivets may come out and do some real damage. 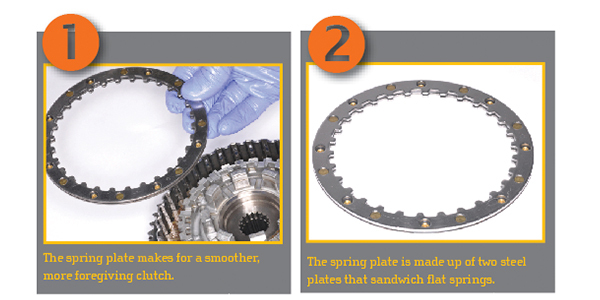 The surrounding clutch plates are usually the first items to be damaged, but the basket, hub and bearings are all at risk with this failure. If enough fragmentation occurs anything in the primary could be damaged. 3. When the rivets in the spring plate fail they are often flung out against the clutch basket where they become wedged and cut one or more grooves into the clutch basket. A clutch basket damaged like this must be repaired or replaced as the grooves can keep the friction discs from moving and thereby keep the clutch from fully releasing. If the damage isn’t too deep, it can possibly be repaired with careful work with a rotary tool and grinding stone or jewelers file. 4. A slipping clutch, or a clutch that refuses to stay adjusted may be a symptom of this failure. Also, metal shavings in the primary oil is an indication all isn’t well. 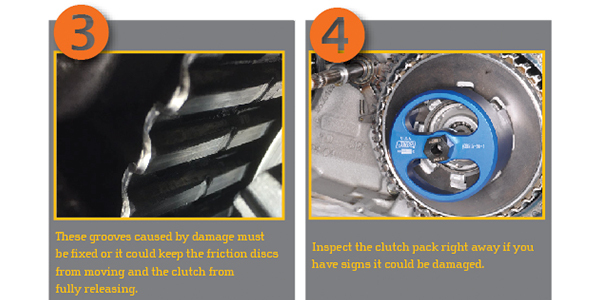 Inspect the clutch pack right away if any of the signs are present. 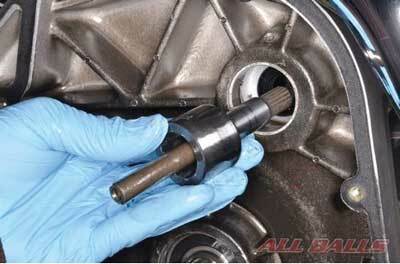 A special clutch spring compression tool will be needed to disassemble the clutch pack. 5. A good thing about this fault is that it is possible to get rid of the grenade plate. The Screaming Eagle replacement clutch pack and many aftermarket clutch packs eliminate the spring plate by substituting two additional steel plates and one additional friction plate. These high performance clutch packs may result in a stiffer lever pull and might not be as smooth as the stock setup, but they are cheaper than replacing a clutch basket. Eliminating a known fault like this isn’t a bad idea for any bike. Eliminating this fault on a bike that is going to be ridden hard or have its engine power increased should be considered a must. Dump the grenade plate and have peace of mind not pieces of clutch. Cyclepedia Press LLC authors powersports service manuals, a specification database and training modules to help technicians efficiently service ATVs, motorcycles, scooters and side-by-sides. Each month Cyclepedia examines real life shop scenarios with recommended tech tips for handling the problems encountered. For more information about Cyclepedia manuals and professional products, visit www.cyclepedia.com.